At first, most people find it confusing due to many options not familiar to them. For the general public, there are options where you can go to the store and pay over the counter or do it online though online banking. Handful Reminder: There is an additional ₱25.00 fee to use any of the NBI Clearance e-payment service but some options may charge another additional fee especially in bank payment options. The particular amount to pay for an NBI Certificate is ₱115 + ₱25.00 additional fee, a total of ₱140.00. The most important key to this transaction is of course your money but also the Reference Number indicated in your application. Write it on paper or take a picture of it. The list below starts from the easiest option according to most applicants and to the most convenient for “techy” people. The easiest way to pay for the NBI Clearance Fee is go to the nearest 7-Eleven Store then give your Reference Number indicated in your application. The NBI Clearance Payment can also be done using your Globe Gcash. Just make sure you have enough load. Another ₱10.00 service fee will be added. MultiPay is a new payment channel innovation of Bayad Center. You must have a Multipay Wallet Account and available load in your Multipay Wallet in order to use it. You can register at www.multipay.ph. Applicants can also pay Over-The-Counter to any BDO, BPI, Metrobank and Unionbank branches. BDO – Perform a Cash Deposit with Reference Number at any BDO branch. Payments are automatically processed after a few minutes. NOTE: A P25 Service Fee will be added. Choose a different bank if you do not agree to this fee. 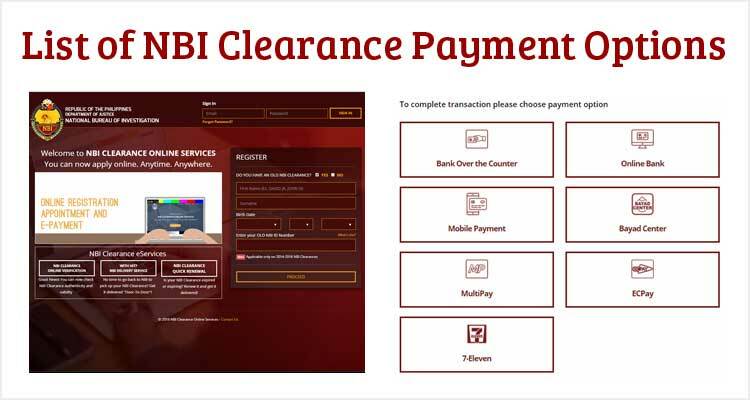 BPI – Pay cash over-the-counter at any BPI branch through Bills Payment. NOTE: A P50 Service Fee will be added. Choose a different bank if you do not agree to this fee. Metrobank – Deposit your cash or on-us check payment over-the-counter at any Metrobank branch nationwide. Branches outside Metro Manila may charge handling fee. Unionbank – Deposit your payment over-the-counter at any Unionbank branch nationwide. Applicants who are using Dragonpay Mobile App or banking online with BDO, BPI, Metrobank, RCBC, Unionbank, UCPB have options to pay using their online banking accounts. Along the app or bank option are specific guides on how to do it. Among the list, NBI Clearance Payment through 7-Eleven and Bayad Centers are the most chosen options. As of the moment, there is no direct way to pay using a Credit Card or Master Card. That was the List of NBI Clearance Payment Options. If you have any doubts or encounter any problem with your transactions, do let us know in comment below so we and the readers can extend any knowledge-based assessment. I wanted to renew my NBI Clearance but wrong timing, it’s updating so I cannot go through. What if I want to pay in NBI Office directly? It’s not in the options but last year, I paid in their office. Bakit po ayaw tanggapin sa 7-11 yung reference number ko. Yung binigay bang reference number sa akin ay pwedeng gamitin para sa ibang accredited payment center? Nag renew ako ng NBI online, then ang ginamit ko yung renew with delivery. Nagbayad nako sa bayad center, 355 pesos binayaran ko. Paano ko malalaman kung natanggap na ninyo yung bayad ko and paano ko malalaman kung kelan madedeliver? sana po ang 711 nag automatic notice sa NBI online Na not Available ang payment ksi system down po at NATIONWIDE Daw po limang 711 ang pinuntahan ko lahat talaga wla kakainis ndi ko alam kung paano mag palit kung saan pwede mo bayaran hmp!!! I’ve tried to pay my nbi on my RCBC online banking and nabawasan po yung account ko pero wala nakalagay sa transaction ko. Pano po yun? Yun bang copy ng receipt ko sa RCBC online banking ko pede bang yun lang ipakita ko? Hi I recently received my authenticated NBI clearance from Philippine Embassy in London and its asking us to enclose check/money order but there has been a new law not sending money through post ( money laundering) how else can we make payment here in London? Pwede po bang mag direct na magbayad sa NBI office?